The differences between you and them: negligible. All you’re really missing are some roadies, roadie-ing all your road stuff. 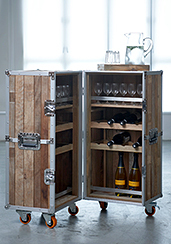 Stuff like the Tree Roadie Minibar, a new mobile repository that’s essentially a minibar crossed with stage-equipment luggage, available now (sans roadies, sadly). So instead of clumsily moving the bubbly, glassware and vintage bottles of port to your vacation house this fall, you’ll use this. It’s eco-friendly (made from reclaimed teakwood) and uses spring-loaded latches, all courtesy of some Hong Kong furniture maestros who construct the whole thing from scratch after you email them (translation: each one is unique). Even better: you won’t have to irritate the old tennis injury to cart it around. Like a proper piece of roadie gear, its mobility is enhanced by six easy-gliding wheels. Which is key when keeping the whole thing tethered to your belt while moving about the house.